With an electric mixer on medium-high, beat oil, butter, sugars, egg, and vanilla until well combined - about 1 minute. On lowest speed add flours, baking soda, and salt followed by chocolate chips and nuts. Do not overmix. Drop by rounded tablespoonfuls onto ungreased or parchment-lined baking sheet about 2 inches apart. Bake for 10 to 12 minutes. Remove to a cooling rack. No whole wheat pastry flour? See Substitutions in my blog. Note: For more on this recipe in my blog click here. 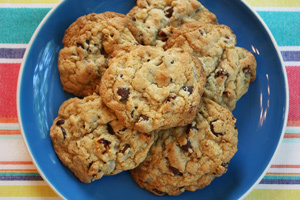 25 Comments on "Whole Wheat Chocolate Chip Cookies"
This is the best recipe for chocolate chip cookies. Thanks for developing one that’s healthier that is also tender with a bit of crunch. The egg I used was a large egg, so I added 1/4 cup extra flour because when it was mixed up it looked too wet and I didn’t want them spreading a lot..
I’ll be doubling the recipe to send to my grandson in college and I know he and his buddies will love them. Just made these delicious cookies for the first time but made 24 instead of 12 by making them a little smaller. They were still a good size and, besides, this way I can eat more of them. 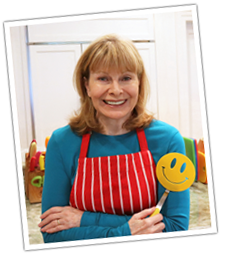 Thanks so much Jenny for all your fabulous and healthier recipes. I love every one I’ve tried and have recommended your website to several people. I love everything you make, Jenny! Amazing. These are now my go to cookies. Thank you Jenny for such an awesome recipe! Oh my Jenny. I thought the Everyday Cookies were my very favorite but now that I baked these Chocolate Chip ones it’s a tie. They are delicious. I made them just as the recipe said. I did add really good Vanilla. It’s Black Vanilla from Dominican Republic. Best ingredients in..best product out. Thanks for a wonderful recipe. Its a keeper. Hello and Thanks for your site. I have a problem with cookies getting hard. Have a good suggestion? Hi Jenny can I make this with only all purpose flour? We love this cookies…f ew questions… Why needs to cool in paper towels and not in the cookie rack?, The cookie supposed to be crunchy? chewing? or soft? mine I can say are crunchy. Did you baked in one cookie tray or two cookies tray? I can not do it just in one time. Wow! I have no idea why I wrote “cool on paper towels.” Duh!! That was just a huge mistake so thank you for asking about it. I am fixing it to say “remove to a cooling rack.” The cookie should have a little crunch on the outside but soft on the inside. I can not bake 12 cookies on one tray. I always use two baking sheets (one at a time) and make sure the sheet has cooled completely before making the 2nd batch. That’s why I have two sheets. If your cookies are too crunchy, you may be over-baking them or using a dark baking sheet. Don’t bake them any longer than 9-10 minutes and don’t use a dark baking sheet. If you don’t make any ingredient changes, you should get great cookies. Please let me know. I want to be sure my recipes work for everyone. Hi Jennu. Do you have a preferred brand for cookie sheets ? At this moment I did not remember which is recommended by American test kitchen. Your other cookie recipe is only oil with no butter. Do you think this recipe can be made with only oil? I was not able to get a good chewy chocolate chip cookie without a little butter. I keep trying though, and I will post it if it ever works. Can this recipe be used with only whole wheat pastry flour? can i use glutenfree flour for these cookies? Hi Jenny, I seen regular whole wheat flour but never seen whole wheat pastry flour. Is there a difference? What brand do you use? Thank you for this recipe, I can’t wait to try it! Regular whole wheat flour is very different from whole wheat pastry flour, which is a much finer grind and more suitable for baking cookies. I buy two brands: “365” brand at Whole Foods and Arrowhead Mills brand at the grocery store. Hi Jenny, Publix had Arrowhead Mills Organic Pastry Flour. Can I use that? Thanks again. Yes! That’s my brand too. Jenny I love your cookie recipes but they don’t make much. I make cookies when we have company and I would love to make these recipes but one dozen for 10 people never goes far especially with your recipes. How would you make these and be able to put out 4 or 5 dozen without having to double or quadruple the ingredients? I don’t know of any way except to quadruple the recipe.